Unforgettable getaways! Sportive-, challenging- , entertainment and teambuilding activities, festive parties, Meeting & events and training camps on a unique location! The drive of our team is to enjoy our guests with a special experience and discover something about themselves. The Wilgenweard in Nijverdal (The Netherlands) is build bar for bar on top of each other like a block package. The result is a large accommodation, almost entirely of Finnish softwood. The Wilgenweard has a capacity of 350 guests. Our accommodation has 3 unique rooms with a various of possibilities for leisure and business, a grand café, 3 different terraces with beautiful views on the activity area and the river. Our Sports Inn/ Hostel in Nijverdal has 12 double rooms. Each room has 2 single beds, a wardrobe , a sink and there is a shower and a toilet for every 2 rooms. The rooms are comfortable and you will get your well deserved rest. The Wilgenweard is located on the edge of the forest and hills of the Sallandse Heuvelrug (National park located in the east part of The Netherlands). The Sallandse Heuvelrug is a beautiful forest area. Part of it is declared a National Park. Directly behind our building you’ll find the smallest river in The Netherlands “De Regge”. We use this beautiful surrounding for most of our activities. You’ll find a various of sports facilities next door which offers plenty of opportunities for athletes and larger events. 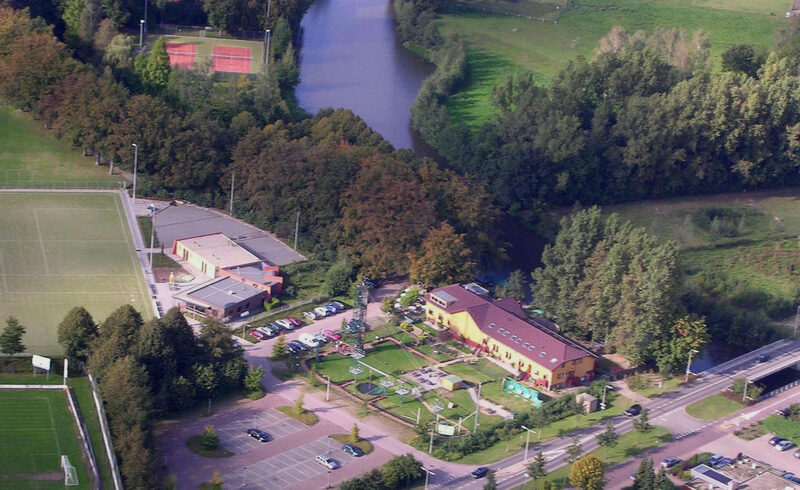 a Sports Inn/ Hostel with all the facilities for a (sport)training camp within walking distance. We offer everything under one roof. Challenging activities, parties, business arrangements and training camps. And all that in a unique location next to the forest and water! Perhaps you are celebrating your holiday in an appartment, hotel or on the campside nearby? 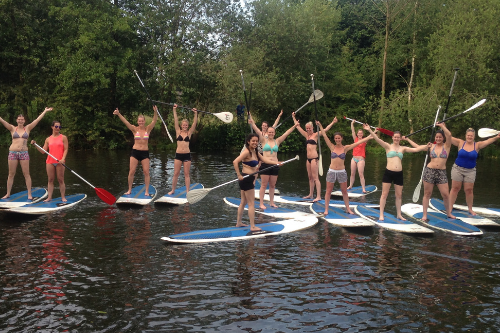 Join us for a couple of hours for some sportive activities like suppen, riding the mountainbike or solex or to canoe. And we have two exciting escape rooms available! Go in with some family or friends and try to escape in less than an hour! Do you have something to organise or celebrate? We will help to organise the perfect getaway. Everything is possible at The Wilgenweard. You may have a suitable own location, which can also be arranged.